Sometimes you can't quite put your finger on what it is you like about a tool or piece of equipment. 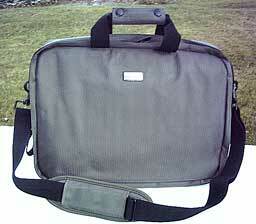 I have several good laptop bags and cases. For my Pismo PowerBooks, there's an old Kerouac backpack/briefcase made by now-defunct Willow that I like a lot and that fits the Pismo like it was made for it - because it was. It's a relatively big case and can hold a lot of stuff besides the computer. Another favorite it the Waterfield Racer-X bag by San Francisco Design tailored to fit my 17" PowerBook (or a 17" MacBook Pro). It's very high quality, well-engineered, and tastefully understated - typical of Waterfield computer luggage. 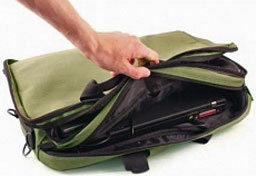 The Proporta Protective Laptop Bag. 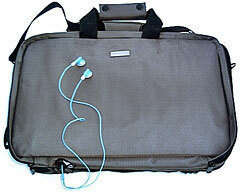 But recently, the bag I reach for when I take a laptop on the road is a Proporta Protective Laptop Bag, which features a very attractive and convenient set of attributes combining reasonably commodious capacity in a relatively compact and light package; attractive looks; comfortable, convenient, and versatile carriage; and decent protection for the computer at a very affordable price. 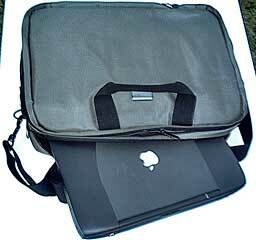 While designed especially to accommodate the Unibody MacBook Pros and MacBooks, the Proporta Protective Laptop Bag swallows up my old Pismo quite comfortably, and in a pinch I can just jam in my 17" PowerBook, although for it the Racer-X is a more comfortable and sensible choice. It will have no difficulty accommodating any current Apple notebook up to the 15" MacBook Pro. The case's outer skin made of Cordura®, a high-strength nylon fabric originally developed by DuPont, now manufactured and marketed by Koch Industries, Inc's Invista subsidiary, and which has proved rugged and durable as nylon fabrics characteristically are. 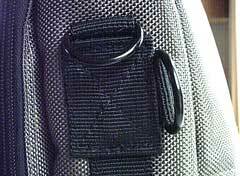 The bag's zippers are black nylon with black anodized metal zip tabs that match various metal D-rings (see photo) sewn on with nylon web straps and loops for attaching the shoulder strap and backpack harness. 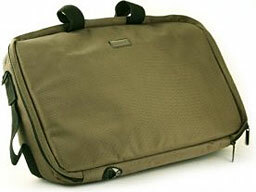 The briefcase carry handle is double loops of nylon webbing with a snap-fasten Cordura handgrip linking them together. It's quite comfortable, although having to snap and undo the fasteners every time you want to open or close the case is a minor hassle. I also find the snaps to be a tad stiff, although they may free up in longer service. There are deep-textured plastic foot panels on the bottom of the case with strong rubber feet to dampen shock when making contact with hard surface when you set the case down, and a nylon carry loop at the end that becomes the top when the case is in vertical or backpack mode. The case's entire front panel, which feels like it's padded with 1/4" closed-cell foam, unzips more than 270°; to open wide and reveal a multipurpose inner compartment with a full width and depth net pocket on the back of the flap that is perfect for storing papers, file folders, magazines, and the like. While it's convenient to have the flap able to open wide for unimpeded access to its contents, there are times when it would be better and more secure for it to only partly open, an option provided for with a couple of snap-fastened web restraining straps. This works well, but as with the handle cover snaps, the snaps here are also on the stiff side. The back face of the compartment has two key fob clips, an elasticized band to hold an iPod or cell phone, a couple of pen/pecil/stylus loops, three elasticized pockets that can hold cables, ear buds, batteries, and other small bits, and a larger, cutaway vinyl pocket. 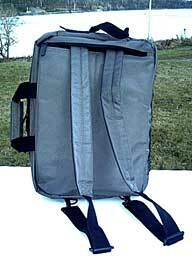 A plastic 20mm grommet (aperture), allows you to feed through cables from the front compartment into the main bag. A second grommet is situated at the bottom of the bag, enabling you to feed headphone or earbud cables through so that you can listen to your iPod with it is safely concealed and protected in the bag. My only criticism is that being at the bottom of the compartment, there is a possibility of very small items - like perhaps a wireless mouse receiver dongle - falling out through the cable access aperture. It would be better positioned at the top, which is also closer to the iPod/cell phone retainer. The computer compartment is, like the front compartment, lined with smooth black nylon taffeta fabric, but is more heavily-padded. At the back of the compartment is a full-width, Velcro®-closure pocket, plus three smaller but usefully deep pockets on its front face. However, you want to be prudent about what you store in any of these pockets, since it will be sharing close-quarters with your computer and there is potential for scratching and chafing. The back panel of the bag is actually another full-width padded pocket that also stores the hideaway backpack harness when it's not being used - i.e., when the bag is carried in briefcase or shoulder-strap mode. The harness, which is of 1.5" nylon web strapping with color-coordinated Cordura nylon comfort pads, attaches to D-rings at the bottom of the case with black anodized quick-release swivel clips. Very slick and neat, however the back pocket's closure zipper must remain open when the case is in backpack mode - a small compromise for the sake of cleaner lines. 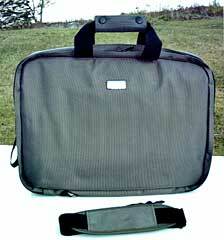 The back pocket is also large enough to actually carry a second, small laptop if you ever had occasion to, such as a MacBook Air or a PC netbook. The detachable shoulder strap is also of 1.5" nylon webbing with a Cordura comfort pad. I really like this bag. It's a clever, sensibly practical, and amazingly capacious designed, considering its light weight, svelte dimensions, and clean styling. You can stuff an amazing amount of stuff inside it and keep it all organized. The materials and workmanship also have a quality look and feel, and for some reason I can't explain it just has a comfortable feeling about it, like a good pair of old jeans. 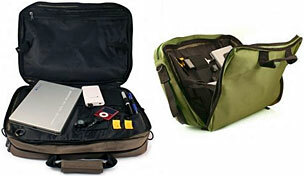 There are certainly more heavily-padded computer cases on the market, and if you're a rough user who road warriors in really harsh environments and conditions, you might want to consider one of them, but this Proporta case will provide medium-duty protection, and does with without excessive weight and bulk. I think that for a substantial proportion of laptop users, it will represent an ideal balance of qualities. Another really cool thing is that the Protective Laptop Bag's price has been cut from the $47.95 it originally sold for when introduced last year, to currently $31.95, a simply amazing value. At that price I have no problem giving it a four LEM rating.